ALL MONSTERS GREAT AND SMALL! This post was written by peterjmurray on April 27th, 2017 7:54 pm Comments Off on ALL MONSTERS GREAT AND SMALL! Kath and I headed up to one of our favourite parts of the country…the Yorkshire Dales! We took a lovely self-catering cottage in the brewery town of Masham – a truly quaint English Dales village. A monster in the Dales! Which one? As I write this blog the town is preparing for the big cycle race (Tour Yorkshire) to pass through tomorrow. I hope we get to see a bit of it. Our first school visit in this great part of the world was just a short distance away…Sharow, near Ripon. The school was small and linked up with another nearby school, Skelton – Newby Hall. They say lovely things come in small packages, and these schools were truly a joy to work with. They lapped up our scary books, BONEBREAKER and MOONWAILER, and we threw in our scary short story collection – TEN O CLOCK CALLER – for good measure. The following day found us returning to both schools to sign lots of books for avid readers. Thank you to Ms Lowe for taking the trouble to book us for this visit – especially after seeing us at two previous schools which she’s worked at. Ms Lowe must be a ‘glutton for punishment’ as they say! Watch out Mr Greenway…I’m coming to get you! Next, it was time to head north of Masham to Leyburn Community School, old friends of ours. We love this school! The children and staff are always so enthusiastic and can’t get enough of our scary books. 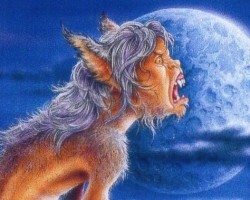 It was such a shame that the werewolf boy, Moonwailer, threatened to make a night time call to one of the teachers at the school, Mr Greenway. I was quick to supply him with a few silver bullets to protect himself, but I’m not too sure he will survive the impending attack. We will find out tomorrow…so watch this space to find out what happens! Bye for now…Kath and I are off to a fab ice cream parlour on the way back to our Masham cottage…well away from Mr Greenway and the Moonwailer! 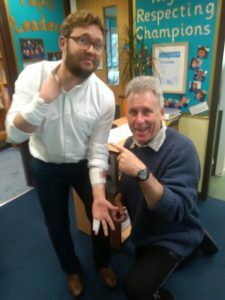 Mr Greenway – proud of his battle scars! * Sad to report that Mr Greenway DID fall victim to the vicious Moonwailer! He managed to scare the beast-boy away with the threat of silver bullets and such, but not before being mauled as shown by his injuries in the picture. 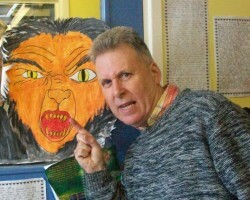 Sorry, Mr Greenway, but you did choose to live and teach in the land of the werewolf, so it’s not all my fault! Our last school visit in the run-up to the Easter break was to a new school to us, St Paul’s RC Primary, on the Newbury-Reading border. Kath and I were made more than welcome and soon found ourselves in front of a VERY enthusiastic KS2 audience. As this was our first visit, I talked about how I became an author under the most unusual of circumstances and this led nicely into a full-blown Mokee Joe presentation. The children and staff seemed captivated and interacted perfectly during the performance. The morning passed only too quickly and we were soon sipping coffee in nearby Pangbourne musing over how much we had enjoyed the experience. We returned to St Paul’s the next day to carry out a book-signing and that went equally well. So many children waiting to get their heads into our books…Great! The Headteacher, Mrs Oster, was proud to point out to us that St Paul’s came out top in the West Berkshire schools re SATS results…and Miss Todd was keen to share with us how important literacy is regarded at the school. Neither of these statements surprised us – it proved such a good school to finish off our hectic schedule of author visits stretching way back to Christmas. A BIG thank you to all at St Paul’s from us both. We hope you really enjoy the books and hope to see you again soon.